by Richard N. Winfield (ed.). Durham, NC: Carolina Academic Press, 2012. 131pp. Cloth. $40.00 ISBN: 978-1-61163-146-3. Over the years, the United States has exerted a great deal of influence on the rule of law as a governing principle in many countries. The global impact of American constitutionalism is illustrated by the direct and indirect transplantation of freedom of speech and the press as an essential element of the functioning rule of law. The basic right to freedom of expression, the most immediate aspect of the human personality in society, is one of the most precious rights of man …. It is absolutely essential to a free and democratic state, for it alone permits that constant spiritual interaction, the conflict of opinion, which is its vital element …. In a certain sense it is the basis of freedom itself, “the matrix, the indispensable condition of nearly every other form of freedom” (LÜTH DECISION, 198). EXPORTING THE MATRIX: THE CAMPAIGN TO REFORM MEDIA LAWS ABROAD is a collection of essays by lawyers, law academics, and others who worked in Africa, Middle East, and the former Soviet Union. The book, whose title is from the PALKO opinion, tells the fascinating first-person stories of the participants in the worldwide reform campaign of the International Senior Lawyers Project’s (ISLP) Media Law Working Group. U.S. media attorney Richard N. Winfield, ISLP co-founder, notes that his book shows “the centrality of the reformers’ demands for freedom of expression and information to the irresistible drive toward democratic self-rule and freedom” (p.xi). In 2006, Winfield observed that once one journalist is restrained from criticizing the government, all the journalists’ rights are equally restricted (Winfield, p.112). Four years later, the noted First Amendment scholar Lee Bollinger, president of Columbia University, echoed Winfield’s thought on a global free press: “No longer can we divide the world into what happens with press freedom in our own country and then view what happens in the rest of the world as ‘human rights’” (Bollinger, p.6). EXPORTING THE MATRIX proceeds from the almost axiomatic principle that media law reflects the power relations between the government and the press (p.109). This is hardly surprising, since freedom of the press contracts and its restraint expands “as the stresses on the stability of the government and of the structure of [*614] society increase” (Siebert, p.10). Authoritarian governments typify this proposition because their real or imagined sense of insecurity leads them to view press freedom as “little more than rhetoric articulated for political expediency” (Russomanno, p.448). Insofar as its title indicates, Winfield’s book centers on media law. But it goes beyond the law directly affecting print and broadcast media. For example, the “Adventures with Freedom of Information” chapter is an FOI travelogue of Bulgaria, Japan, Mexico, and other places. Its author, Robert J. Freeman, executive director of the New York State Committee on Open Government, asserts correctly that the United States no longer inspires the rest of the world on access to information. Rather, Americans, to whom FOI is not a constitutional right, need to learn from other FOI-friendly countries to make their laws “more meaningful and effective” (p.67). Similarly, the chapters on Yemen (“An International Pro Bono Project: Commitment through Collaboration”) and Kuwait (“The Idea of Information” and “Transparency as a Political Hot Button: The Case of Kuwait”) pay extensive attention to FOI issues. What a fitting topic for media law reformers amidst the ongoing right-to-know revolutions around the world (Mendel, p.41). The book primarily concerns exporting the U.S.-defined negative freedom of the press, which Professor Owen M. Fiss of Yale Law School has advised local reformers to adopt “only selectively” (Fiss, p.157). But it is not limited to American media law. Judge Willen F. Korthals Altes of the District Court of Amsterdam in Netherlands devotes his chapter to his teaching of the European Convention on Human Rights (ECHR) to journalists, lawyers, and judges in former Eastern bloc countries. His chapter tends to be more descriptive than analytical. Nonetheless, it discusses the growing relevance of the ECHR on the positive freedom of speech and the press to the “transitional democracies” in the former Soviet Union (for a succinct discussion of the U.S. First Amendment on negative freedom versus the ECHR Article 10 on positive freedom, see Eko, pp.95-96). As is often the case with edited volumes, the chapters of EXPORTING THE MATRIX are uneven in their quality. Some chapters are in depth and comprehensive, while others are less substantive and more episodic. Still, some of the discussion is repetitive. A couple of chapters diverge considerably from the book’s focus of engaging in global media law reforms. Especially the “India, Press Freedom, and the Dead Hand of the Raj” chapter might tempt some discerning readers to wonder: Why is India’s sedition law included? What was the actual ISLP role in reforming the Indian law? On the other hand, three chapters – Professor Monroe E. Price’s “Present at the Creation: The Long Shadow of the Reform Campaign,” attorney Kurt Wimmer’s “International Media Law Reform: One Size Never Fits All,” and Professor Peter Krug’s “News Media Law Reform: Information Activities” – are valuable reading. The Price chapter offers an overview of media law reform activities abroad. [*615] Price, an influential comparative media law and policy scholar at the Penn’s Annenberg School for Communication and at the Cardozo School of Law, has been a key individual behind the global media law reforms of American lawyers and law scholars. His chapter starts with nearly a dozen lessons from his 20-plus years of media law-related assistance. Among the lessons he discusses are: “Understand the field”; “Be open to the possibility that the U.S. paradigm may be flickering”; and “Be sensitive to the enabling environment” (pp.3-6). Particularly perceptive are Price’s thoughts on the future of media law assistance. He takes note of the “huge changes in where demand exists and how that demand manifests itself” (p.11). Be prepared to be inspired, moved, and motivated (pp.13-19). Wimmer fleshes out each lesson with stories of his own and others. His chapter stands out for its lucid writing and insightful analyses of various opportunities and challenges for media law reformers abroad. To me, the basic questions inherent in news media law … will naturally arise in any legal system. It is the role of global education efforts to publicize and advocate the mechanisms of substantive law and process for accommodating these competing interests. These mechanisms, of course, vary from country to country, and therefore it is the exchange of views between representatives of different systems that in my opinion is of great value (p.36). 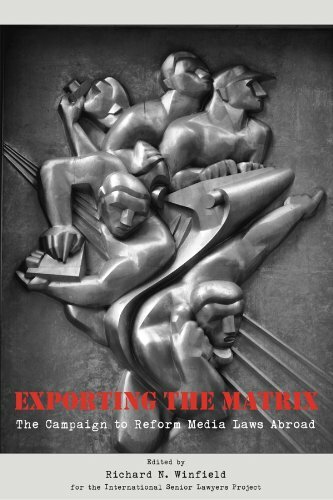 Overall, EXPORTING THE MATRIX will be useful as a supplemental text to American students and scholars in journalism, law, and international studies in developing what Winfield has aptly called a “reverse perspective” on press freedom (“Globalization Comes to Media Law,” p.116). The book is refreshingly accessible as a resource on media law issues in some of the rarely noticed countries and regions (see the “Pursuing Elusive Freedom in West Africa” chapter). Whether as a matter of media law practice or teaching and research, we do need more such books in making the international marketplace of ideas closer to reality. Bollinger, Lee C. 2010. UNINHIBITED, ROBUST, AND WIDE-OPEN: A FREE PRESS FOR A NEW CENTURY. Oxford University Press. Eko, Lyombe S. 2012. NEW MEDIA, OLD REGIMES: CASE STUDIES IN COMPARATIVE COMMUNICATION LAW AND POLICY. Lexington Books. Fiss, Owen M. 1996. LIBERALISM DIVIDED: FREEDOM OF SPEECH AND THE MANY USES OF STATE POWER. Westview Press. Mendel, Toby. 2008. “Freedom of Expression Attains Legal Maturity.” In Callamard, Agnés, ed., SPEAKING OUT FOR FREE EXPRESSION: 1987-2007 AND BEYOND. ARTICLE 19. Russomanno, Joseph. 2013. “The ‘First Amendment’ in Nepal: How Madison’s America Informs Press Freedom Efforts Globally.” COMMUNICATION LAW & POLICY 18: 425. Siebert, Frederick Seaton. 1952. FREEDOM OF THE PRESS IN ENGLAND, 1476-1776. University of Illinois Press. Winfield, Richard N. 2006. “Globalization Comes to Media Law.” JOURNAL OF INTERNATIONAL MEDIA & ENTERTAINMENT LAW 1: 109.